The retina is a multi-layered nerve tissue that lines the posterior part of the eye. 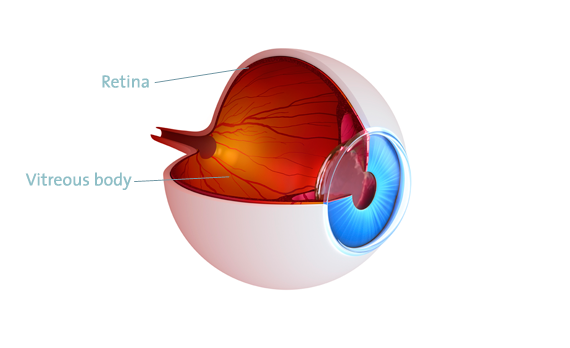 In some parts of the eye the retina is closely attached to the vitreous. For this reason, diseases of the vitreous can cause diseases of the retina. Diseases can affect the retina, which is responsible for recognizing “light and dark” as well as movements, or even the central retina (macula) which has the largest concentration of photoreceptor cells and is responsible for your near and distance visual acuity. You have troubles with reading, blurry vision in the center of your visual field or see wavy lines (macular diseases as e.g. membrane formation, macular hole formation, macular degeneration). You see a shadow, experience a deterioration of your vision or have similar symptoms (retinal diseases such as retinal detachment). Visual disturbances such as flashes of light, dots, black rain or “flying mosquitoes” or floaters (indication for the development of a retinal detachment, acute symptoms of a posterior vitreous detachment). Diseases of the retina are “pain-free”. Therefore, the visual quality is the main indicator for these diseases. If you have these or similar symptoms, a careful eye examination is required to clarify the exact cause. An optical coherence tomography (OCT) may be worthwhile. OCT is an important diagnostic tool for early detection and monitoring of diseases of the center of the retina (macula) and the optic nerve. An OCT examination is non-contact, painless and not associated with any side effects. I can perform the OCT in my medical practice without any waiting time, which may occur in a public hospital. Depending on the results of the eye examination, a surgery may or may not be necessary. In a comprehensive conversation, I will advise you about the necessity of a surgery, the details of the procedure, the expected surgical outcome and possible side effects. It is a major concern for me to address all of your questions and to explain in detail how the surgery will be performed. Should the examination of the posterior part of your eye show diseases like “exsudative” age-related macular degeneration (AMD), diabetic or vascular diseases, the treatment with intravitreal injections could be useful. Usually these injections are performed ambulatory and under local anesthesia with eye drops. The medication is delivered into the vitreous cavity through a tiny injection cannula. I have successfully performed thousands of intravitreal drug deliveries. After this IVT you will get moisturizing eye drops, an eye bandage for a few hours or – depending on your visual function and your preferenc – a transparent eye shield. After an intravitreal drug delivery eye pressure checks are required (after 1 or 2 weeks) as well as an eye examination including visual acuity testing and OCT (after approx. 4 weeks). Vitrectomy is a surgical procedure suitable for treating retinal diseases. Vitrectomy works in a similar way as endoscopy. As a replacement the eye is filled with fluid. Vitrectomy is performed under general anesthesia. Please expect to stay 2 to 4 days in the clinic. Please avoid swimming, sauna and similar activities after the operation for approx. 2 to 3 weeks, physical stress and sports for approximately 3 to 4 weeks. For “easy” vitrectomies, I usually use very small openings and get excellent functional and anatomical results. These tiny instruments are very suitable for diseases in the center of the retina (macular diseases), like for example epiretinal membranes or macular holes. Epiretinal membranes are thin sheets of fibrous tissue developing in the macula. Macular holes are small breaks in the macula. Both can impair your vision, especially when you are reading. The most common symptoms include distorted vision (lines are not straight) and the deterioration of your vision. In case of these macular diseases membrane peeling will be performed in addition to vitrectomy. In case of macular holes, an intraocular tamponade will be used. This is an air-gas mixture, which is used to stabilize the inside of the eye and/or for the closure of the macular hole. This mixture disappears in a few days or weeks by itself and is naturally replaced by aqueous humor produced from your eye. For treating a retinal detachment (Ablatio retinae) either vitrectomy (with or without tamponade) or a buckle surgery (sponges or bands) will be selected as the primary surgical procedure. Depending on the result of the examination, the retinal detachment is a more or less acute event, which can also threaten your vision. A retinal detachment can be treated only with surgery. The functional outcome (vision) and the anatomical success (retinal attachment rate) depend on the severity of the retinal detachment and the duration. Warning signs before the development of a retinal detachment can be visual disturbances such as flashes of light, spots, black rain or floaters. When you have these symptoms, it is extremely important to have a retinal examination. You should have this examination within 1 or 2 days. After dilating the pupil with eye drops, a so-called three-mirror contact lens examination will be performed, which shows retinal changes from the center to the periphery. Should this examination show a retinal tear (hole formation in the retina), I can quickly do a laser treatment, and thus reduces the risk of development of a retinal detachment. This laser treatment is ambulatory. It needs approximately 10 days for developing sufficient laser spots (scars). During that time, you should avoid sports, reading and computer work. Unfortunately, despite laser treatment a retinal detachment cannot be completely ruled out in the future. It can be caused by traction forces of the vitreous on the existing retinal tear or by newly developing retinal tears. Usually, you will notice symptoms indicating the development of a retinal detachment quite late, such as a shadow rising from below, a descending curtain or a sudden decrease in vision. For this reason I’m checking on my patients more frequently after a laser treatment. In addition to laser therapy for treatment of retinal tears I also perform laser treatment for diabetic retinal changes or vascular diseases. Laser therapy is also used for the treatment of capsular fibrosis (membranes developing above the intraocular lens after cataract surgery). All these laser treatments are done ambulatory and with pupil-dilating eye drops. If you have questions about retinal diseases or operations, please contact me.